An approach appreciated by Tina Harrison, marketing coordinator for USAopoly. “MBN providing such a diverse group of designs from the start was really inspiring for us internally, but also gave them the opportunity to really hone in on what we were looking for,” she remarks. The prototype was especially important as the final concept has functional and innovative enhancements. “One of our team members had a phenomenal idea to create a sheet that goes directly underneath the box cover that would take advantage of die cuts on our cover concept,” Garcia explains. “The sheet has multiple illustrations on it, and it could be position in any of four ways. Each position shows a different image through the sketchpad die cut.” This adds visual depth to the packaging and offers product variation without adversely impacting pack-out times or retailers’ merchandising processes. 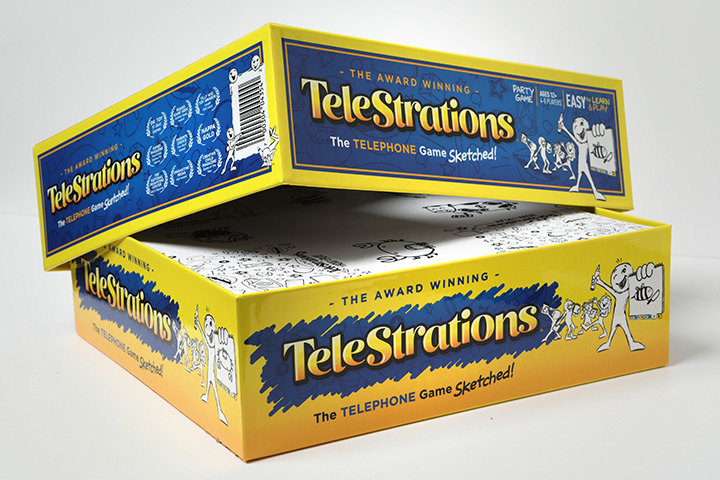 USAopoly stressed the value of Telestrations’ Mr. Sketchy character in the creative brief, and MBN honored that. 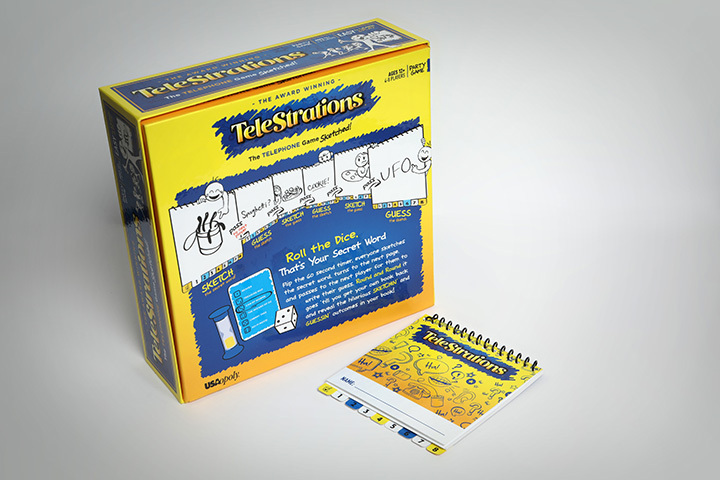 The agency noted that Telestrations was a party game though, so MBN gave Mr. Sketchy a family to quickly communicate the idea of a party game to shoppers. MBN also kept the dry-erase sketch pads used in the game, but updated the illustrations and primary color to have a more modern feel. Another improvement beyond the package design was the inclusion of a secret word envelope in the sketchpads that prevents players from accidentally seeing the “secret word” during game play. Finally, the firm wanted to celebrate the 10-year anniversary and the charitable mission with an upscale treatment. Removable gold foil stickers celebrate both, and still lets retailers use the stock in 2020 and beyond. 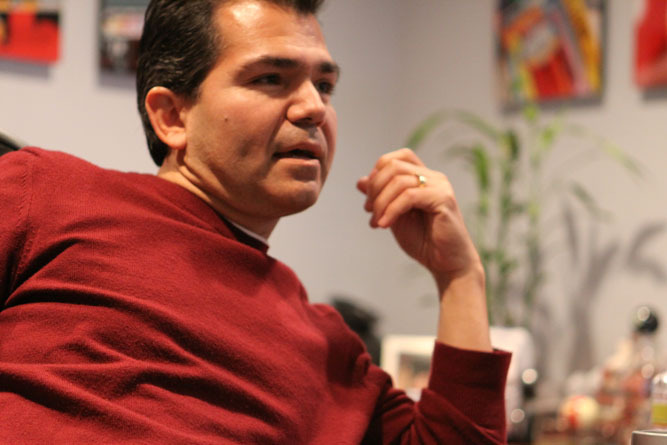 Hector García is the president of MBN Creative Inc., a Hispanic-owned company located in Anaheim, California. His company has been in business for almost 15 years and specializes in branding and design of consumer packaged goods. The majority of his business focuses on food and beverages, in addition to cosmetics, healthcare, office supplies and a variety of other areas. MBN Creative employs eight people, five of whom are minorities, according to García. García was the first in his family to venture into business. "This endeavor was like blazing a trail without having anyone to follow or guide me. I grew up in a rough part of Los Angeles and narrowly escaped being a statistic of the ghetto," he explained. "It humbles me greatly when I see where I came from and reflect on how truly blessed I am." MBN Creative and El Pollo Loco team up to release the famous Pollo Bowl® into supermarkets. After years of avoiding entry into the supermarket arena – where profit margins are razor thin – El Pollo Loco is spreading its wings into retail. The Costa Mesa-based chicken chain has created a frozen version of its Pollo Bowl, which is now being sold in roughly 100 Costco warehouses in Southern California. It is also stocked in 600 supermarkets, including Ralphs, Food 4 Less and Smart & Final. “We see a real opportunity because there’s no real high quality Mexican brand in the frozen food sector, said Joe Stein, El Pollo Loco’s senior vice president of strategy and innovation. The move comes as El Pollo Loco looks for new ways to make money and increase brand awareness. Earlier this month, the chain launched steak – one of several new foods El Pollo Loco plans to add to its menu this year. Stein said El Pollo Loco has spent two years investigating how to bring the right product to market. It had to be something portable and easy to recreate, he added. The chain eventually came up with a frozen version of its Pollo Bowl and pitched the idea to Costco. The chain tested it in San Diego warehouses last fall and found that it sold well. Over the holidays, the product expanded to 100 warehouses in Southern California, including Orange County. The Costco item is sold for $13.99 and includes six, 16 oz. Pollo Bowls. The bowls sold in supermarkets are different in size and ingredients. The grocery stores sell a 4-pack of 12-oz. bowls, that contain the exact same ingredients sold at the restaurants. Cost: $8.99-$9.99, depending on the store. The Costco bowls offer cheese, which is not a regular topping on bowls served at restaurants. Stein said Costco insisted on adding cheese because the warehouse chain thought the bowls would sell better. Research shows that El Pollo Loco is entering the frozen food sector at the right time. With consumers cutting back on dining, more are turning to convenient frozen items to eat at home or at the office, according to market research firm Packaged Facts. Local restaurant chains that have entered the frozen food market over the past few years include Newport Beach-based Ruby’s Diner, Irvine-based Yard House and Cypress-based Real Mex Restaurants. The latter is the parent company of El Torito, El Torito Grill, Acapulco and Chevys restaurants. For years, Marie Callender’s has also offered a large line of foods in supermarkets. Over a five-year period between 2008 and 2013, frozen food sales are forecast to grow 25 percent to $64.8 billion, Packaged Facts said in a 2009 report. El Pollo Loco is taking advantage of that demand. Stein said the bowls, so far, are exceeding expectations with more than $4 million in sales. The chain is working with other grocery chains, and it expects the bowls to be in 1,000 stores relatively soon. As for new retail products, Stein said he’s looking at the possibility of bottling and selling the chain’s avocado salsa and creamy cilantro dressing. The chain is also investigating the possibility of selling pre-marinated chicken for barbecuing and or selling the company’s famous citrus-marinade separately. MBN Creative’s one and only Hector Garcia was nominated for the 2011 Orange County Business Journal Excellence in Entrepreneurship Award! It’s been a long 13 years since Hector opened MBN Creative and it is a great honor that he be recognized for his grand achievements, the MBN Team is very proud of him and we have no doubt that he will continue on with even greater successes. 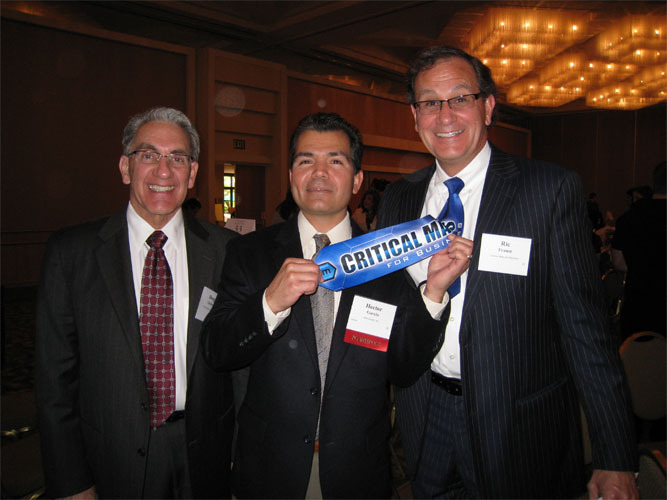 IRVINE, Calif. Critical Mass for Business is proud to announce the nomination of one of their members, Hector Garcia of MBN Creative, Inc. for the prestigious 2011 Orange County Business Journal Excellence in Entrepreneurship Award. MBN Creative Specializes in Brand Development, Brand Refresh and Package Design for national and multi-national accounts as well as fortune 100 companies. We’ve partnered in developing successful branding solutions for many Household Names such as City of Hope, El Pollo Loco, El Torito, Golden Spoon and Hi-Liter to name a few. Richard is the author of two books: CRITICAL MASS: The 10 Explosive Powers of CEO Peer Groups and CRITICAL MASS: The Power of CEO Guiding Principles. He hosts business talk show on www.OCTalkRadio.net. He is a sought after speaker on topics of interests to CEOs and business owners of mid-market companies. MBN Creative’s President, Hector Garcia, was “pleasantly ambushed” for a surprise radio interview on March 23rd. 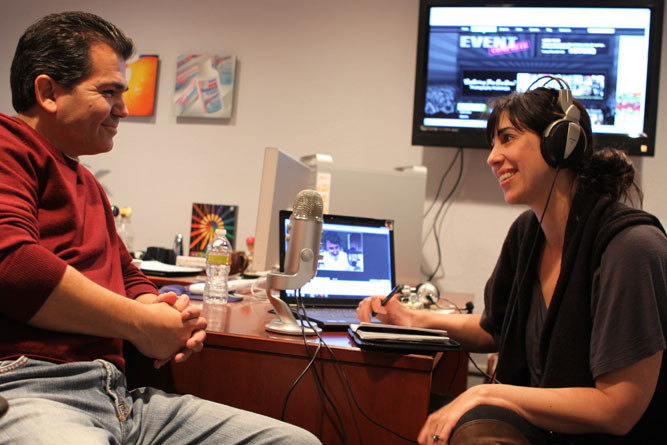 Michelle Patterson from Event Complete and Paul Roberts from OC Talk Radio speak with Hector about the creative design process, how his team takes an idea and develops it to a finished product. During the show they take a look at how MBN Creative has partnered with national companies in developing successful branding solutions for household names such as City of Hope, El Pollo Loco, El Torito, Golden Spoon and Hi-Liter to name a few. MBN will be partnering up with CEO Michelle Patterson from Event Complete, who has been the visionary and creator behind the multitude of successful events and national workshops. Michelle Patterson was congratulated by CEO Andrew Mason of Groupon on Event Complete’s all time Groupon record for their Capturing True Emotion workshop.